Just wanted to pop in to give a quick status update as I've been rather negligent lately on the blog post front. It's been a busy year in terms of preparing for the holidays. I'm not exactly certain why, but it feels like I've done a lot more shopping this year than for Christmases past. So I sat for the JLPT N1 at the beginning of the month. It was a little rough. I felt like my reading ability has improved comprehension-wise, but I ran out of time before I could finish the section. Guess I need more speed and endurance on that end. Given that I'm shifting to IT study mode, I'm not sure if I'll be working to take it again next year; will have to wait and see on that. I'll just need to be mindful about putting in enough time with Japanese media to make sure I don't lose what gains I've made. I wish I could guarantee a lot more posts for the second half of this month, but what with Dragon Age Inquisition and Fantasy Life almost certain to come my way for Christmas, plus Suikoden and Suikoden II on my plate...well, it doesn't look too good, I'll be honest. 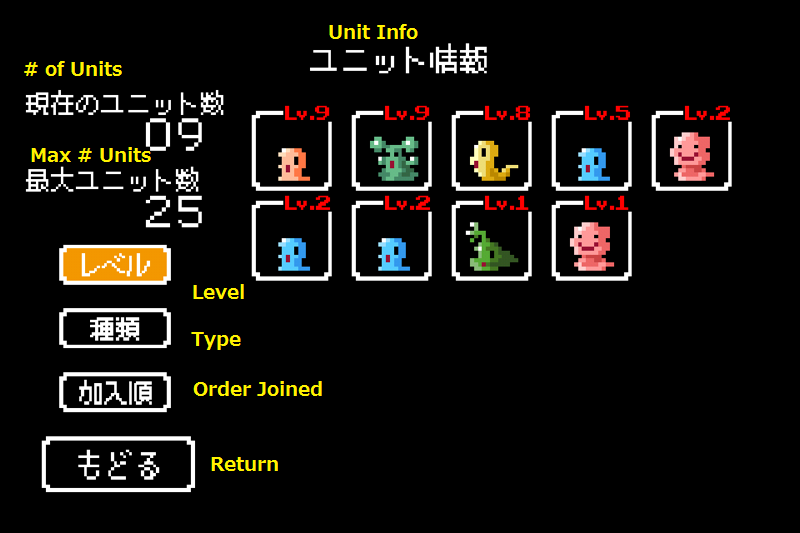 That said, 2.0 of Ambition of the Slimes was released the other day, so I'll try to update the guide soon. Anyway, that's it for now. Merry Christmas and happy holidays to you all! A belated happy Thanksgiving to my American readers. I hope you had a wonderful day and hopefully a little time to relax! Myself, I'm balancing the relaxation with an increasing need to study. On one hand, I've decided to change tracks and pursue IT. It seems to be a pretty lucrative field with a lot of jobs (as compared to just looking for Japan-related positions), and I've always liked computers. I'm hoping to get my CompTIA A+ certification early next year, but the study guide is 1400+ pages, so...yeah, a lot to go through. On the other hand, I have no intention of abandoning Japanese. Refocus a bit yet, but I still may have a more serious go at translation someday. And with that in mind, I'll be sitting for the JLPT N1 again this Sunday. I don't feel adequately prepared, but at least I'm still working at it. And so in the spirit of N1 study, I offer up this grammar point I! I was going through my good ol' Kanzen Masters grammar study book when I came once more across this one. 皮切りにして (かわきりにして） - "to begin with." Now I could just file that away and move on, but it I'm more likely to remember if I actually try to figure out the structure behind grammar points like this. Literally, this looks like "Cut the skin and..." And yet it somehow works out to "beginning with." There must be some interesting story behind this expression, right? Cue the Google digging. Ah, results. It seems this expression finds its origin in traditional Eastern (Chinese) medicine. 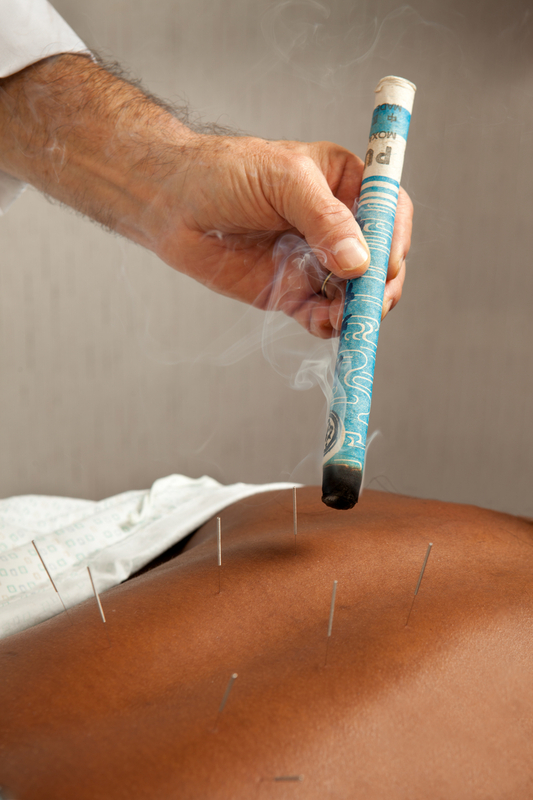 Specifically, something called moxibustion. Huzzah for learning new English words, too! Moxibustion is, apparently, in the same vein as acupuncture. Except instead of sticking people with needles, you stick them with burning, uh...sticks. And this can also be done in conjunction with acupuncture needles. Sounds relaxing, right? That "being flayed" sensation means it's working. Well as you might imagine, this can sting a bit. The expression came about because at the start of being moxibusted upon (I'm sure that's not the medical term for it, but please excuse this humble layman), one feels as if one's skin is being cut. Ouch. Hence "Cut the skin" came to mean "to begin with." In my researching of the Japanese version of the Hobbit the other day, I was a little let down by the Japanese presentation of Biblo's Egg Riddle. Still, I did come across an interesting translational decision. In English, the corrupted hobbit-creature Gollum is so named because of the "horrible swallowing noise in this throat." This is illustrated especially well in Peter Jackson's LOTR films, I think, wherein Smeagol periodically coughs out his more sinister moniker, "Gollum." This seems to happen when he is about to give in to his darker nature. In Japanese, Gollum's name is translated as 「ゴクリ」, which is a gulping, swallowing sound. It's a little more literal than its English counterpart, as "Gollum" isn't a conventional word or sound in English and 「ゴクリ」 is in Japanese, but think this is still a nice way of rendering his name. It appears that the Seta Teiji, who translated Tolkien's the Hobbit and Lord of the Rings into Japanese, got creative with a number of Middle Earth's proper nouns, and Gollum isn't the only name to have been adapted for Nihongo. Some of those other translations may be a nice topic to explore in the future. Today I was thinking a bit about the Hobbit (because that is the sort of thing I think about); specifically about the novel and the old Bass and Rankin animation that had so much charm. Definitely worth a watch! yet golden treasure inside is hid. The answer, of course, is an egg. Or "eggses" might also be acceptable. I was wondering today whether the Japanese version of the riddle is a literal translation, or maybe something with a delightfully poetic spin. The English version rhymes, and rhyming can be quite challenging to translate satisfactorily. The meaning will come across, but the flair, the feeling, some nuance, will often be lost. A quick Googling brought up an old Japanese Middle Earth blog post from a few years ago, before the release of the recent movies, in which the writer shares the text of the riddles bandied back and forth between the hobbit and the, er...Gollum. Alas, it turns out to be a literal translation. Functional, yes. But lacking that something. At any rate, now I totally want to read the Japanese version of the Hobbit. I'll have to add it to the massive queue of J books I have yet to get through! 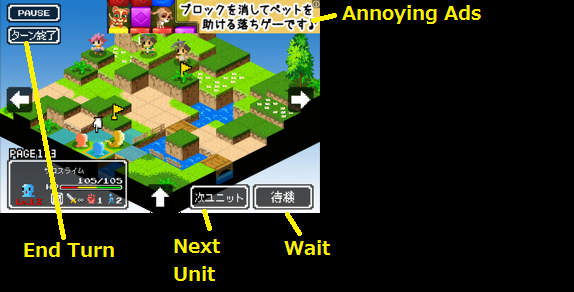 On one of the updates to my Ambition of the Slimes English guide, I came across an interesting translational situation. 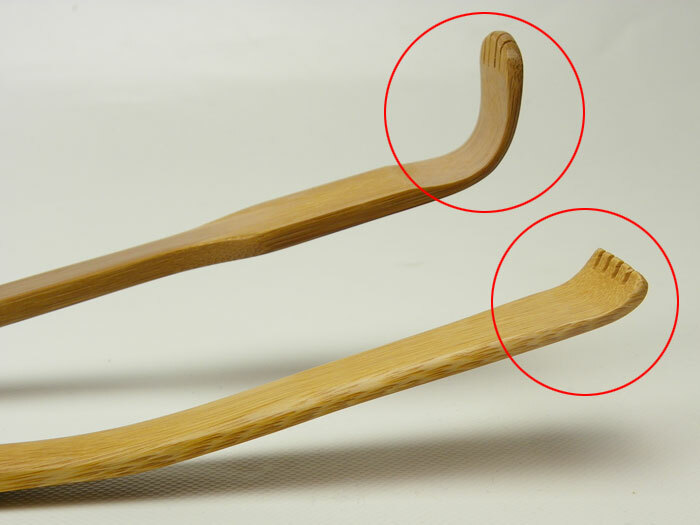 Literally, this means "back scratcher" in Japanese. See the resemblance? The explanation for this slime's name could be as simple as that. However, my research uncovered a little bit of a story behind the Japanese word. The kanji form of マゴノテ is 「孫の手」, which means "grandchild's hand." If you go a little deeper - according to Wikipedia, the word was originally 「麻姑の手」(まこのて）. "Mako" (麻姑) is the Japanese version of the Chinese deity Magu. Magu was a beautiful female immortal who had some association with the elixir of life, and was known for possessing long, claw-like fingernails. There's apparently an expression - 「麻姑掻痒」(まこそうよう) - "Mako scratches the itch," which means something like "everything going according to one's desires." Anyway, the word for "back scratcher" started off as a reference to the hands of Mako, which would be perfect for such a task. It seems "Mako" eventually morphed into "Mago" (grandchild), though, owing to the fact that the back scratcher's "hand" more closely resembles that of a child than a claw. This brings us back to the eponymous slime. If I were officially translating the game, I'd be sure to clarify with the developer on this point. However, in my judgement he's referring to both the physical similarity between the slime and the shape of a back scratcher and the divine association of the goddess Mako. It seems that Mako had something to do with the elixir of life; meanwhile the slime's special ability is that when damaged it splits into two, restoring itself in a fashion. Rather than translate its name as "Back Scratcher Slime" I thought it better sounding to stretch a little bit and kind of localize it as "Goddess' Hand." The meaning of the name may not really be clear to English speakers, but then there are tons of references to ancient religions and lore in all kinds of games (especially JRPGs) that casual gamers may not pick up. Yesterday the WSJ reported that Softbank, one of Japan's major players in telecommunications, is looking at possibly entering the Mexican market. You may remember that Softbank acquired Sprint last year to enter the U.S. market. Thus far it's faced high hurdles in trying to bring Sprint's mobile network up to snuff and stanch its hemorrhaging of subscribers. It next turned to T-Mobile, and was attempting a deal which would have combined the #3 and #4 U.S. mobile carriers in a bid to challenge Verizon and AT&T. Softbank's CEO, Masatoshi Son, promised to bring stiff competition to the U.S. that he said would result in lower prices and faster speeds for consumers. Unfortunately that deal never materialized as U.S. regulators signaled heavy resistance to the idea. Four, apparently, is the magic number of competitors for this administration, even if Sprint and T-Mobile combined still trail AT&T and Verizon individually in terms of size. Son appears to be shifting his focus, if only for the moment, to another opportunity in Mexico. Dominant telecom America Movil announced that it is divesting parts of its network in order to avoid new regulations. The word is that Softbank is examining a bid for those assets. In other news, Japan's Ministry of Internal Affairs and Communications (MIC) is imposing a new regulation on the nation's mobile carriers. Smartphones and tablets will now from next year have to be sold with unlocked SIM cards upon customer request at no additional charge, which would eliminate the traditional two-year contract that usually binds customers in Japan (and in the US, as well). This move is anticipated to create more price competition among the big three carriers, pushing down prices. With unlocked SIM cards, consumers will be able to easily leave their current network and sign up with a competing carrier. Although I'd love to see a similar move in the U.S., requiring unlocked SIM cards wouldn't be enough here. There are two major mobile technologies that carriers operate their networks on in the States - CDMA and GSM. In Japan, all (that I know of) the networks are run on CDMA technology. In the U.S., Verizon and Sprint use CDMA, while AT&T and T-Mobile use GSM. This means that phones sold by any of those carriers is only equipped for one technology - either CDMA or GSM. Even with unlocked SIM cards, consumers with a Verizon phone would only be able to go over to Sprint's network or vice versa. Likewise AT&T and T-Mobile phones would be interchangeable with each other but not the CDMA networks. So even if politicians in the U.S. had the guts and political capital to require SIM card unlocking (I wonder at the likelihood of this, considering a law legalizing SIM card unlocking was just recently passed), it would mean little unless all phones were also required to carry chips to support both CDMA and GSM technology. At any rate, "woot" for Japan. I've been subscribing on and off to TV Japan for a couple of years now. It's expensive - about $20 per month, but it's great for trying to keep up with popular Japanese TV shows and news. The main reason I like to watch it is one show called 「伝えてピカッチ」. The English name is "BrainFlash!" I'm a fan of Japanese variety and game shows. Back when I lived in a Chiba public dorm while I studied abroad at Sophia University in Tokyo, I used to catch part of a kanji-themed gameshow sometimes at dinner. There was a TV in the cafeteria that would have it on. I don't remember a lot about it, honestly. In one segment, contestants would try to guess the proper readings of difficult kanji. I think there may have also been drawing segments. In any case, my ability level wasn't high enough to understand most of what was going on, but it was fun to see anyway. 「伝えてピカッチ」takes two teams - usually men versus women, and pits them against one another in creativity and communication-focused events. One frequent segment is called 「粘土でピカッチ」("clay brainflash"), for example. In this round, one member of the team is the guesser and the others must use clay to sculpt whatever the secret word is. So if the word is "dog," each team member has to make a little dog out of clay. The opponents then gets to choose the order in which the guesser gets to see the sculptures, and the team gets more points the quicker he correctly answers. There are also games that focus on drawing, describing words, and more. The games themselves are fun to watch and a great way to build vocabulary, but I love seeing the interaction between the contestants. They're usually all Japanese personalities - comedians, musicians, athletes, etc. Generally 4 or 5 of the contestants are regulars, with the others being guests that are invited onto the show. Oh, as to what the title means - 「伝える」means "to communicate" and 「ピカッチ」(pronounced "pikachi" is the sound of a flash or spark. "Pikachu" is meant to sound like this, too, incidentally. This has also become a catchphrase of sorts on the show. When someone thinks they know the answer, they will often exclaim 「ピカッチ！」 - "Aha!" So 「伝えてピカッチ」is literally something like "Communicate and understand." For now, I did find this video that may be taken down at any moment, but it shows a full episode. The guests in this one are all members of the Takarazuka Revue - an all female theater group that's based in Hyogo. Their home theater was actually pretty close to where I used to live, and I went to one of their shows once. High quality stuff. Update: Well that video was removed pretty snappily. So...here's a different one! If you're a fan of Japanese pop culture or you've been over there, no doubt you're familiar with the mascots. Regions, companies, airports - there are mascots for this, that, and every other. Usually these characters are created to appeal to the Japanese love of 'cuteness.' They're silly and/or adorable. かわいい, they say. 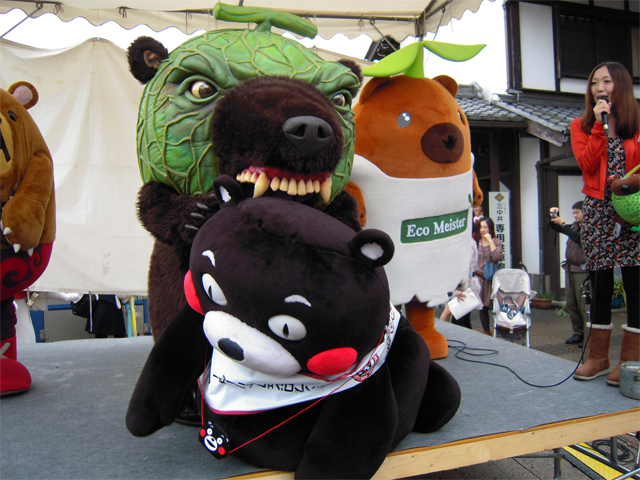 Take Kumamon - the official mascot character of Kumamoto prefecture. He's been traveling a lot recently both domestically and overseas to promote his hometown. And boy he is popular. Look at his cute, red cheeks. 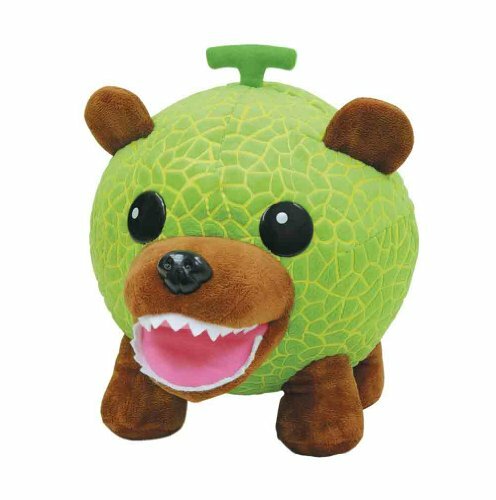 This is the real Melon Bear biting the sh*t out of Kumamon. Sweet Lord. It's like they figured there was too much competition in the "cute mascot" arena, so they just said screw it and went for "disturbing nightmare-inducing aberration" instead. I guess the Hokkaido guys get a kick out of it, and to be honest their blatant disregard for what their countrymen find to be appealing or sane marketing might convince me to buy one of their melons if I were still living over there. Here's a video of him in action. Update (1/13/2015): Feel free to read below for tips and the slime guide, but as of yesterday the developer has implemented English support. I think I'm ready to declare "mission accomplished" and cease updating, as the main goal of this guide was to allow non-Japanese-speakers to give the game a whirl. I hope it served its purpose! 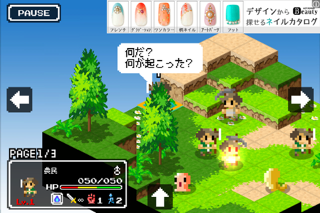 Touch Arcade reported recently on an interesting-looking tactics game currently out for iOS. Strangely, it's available in the US app store, but is almost entirely in Japanese. Finally a chance to put these language skills to use? First a few words about the game, and then a quick and dirty guide for those who may want to give it a shot without entirely understanding everything. 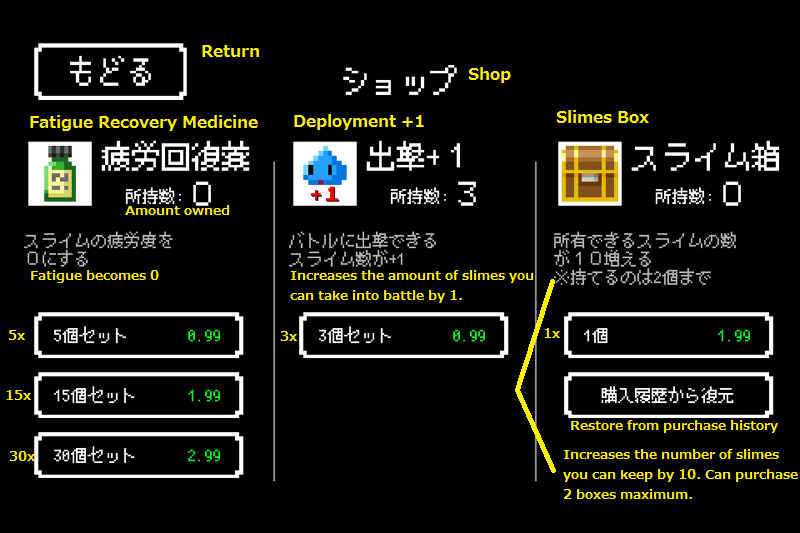 Ambition of the Slimes(iOS/Google Play) (スライムの野望) is free to play, though it does offer some IAP in the form of items. Ads run in the upper corner of the screen, but there doesn't seem to be any way to pay to remove them. they can be disabled. See the section on that below. 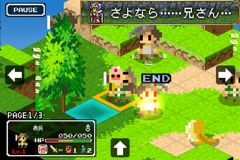 The premise of the game is that you control a group of slimes that are rising up against the humans, who have conquered the world and brought it to the brink of ruin. Humans attack slimes without provocation. Now, it seems, is the time for payback. Slimes are weak as poo. When they level up, they gain very modest increases to HP, attack, and defense, but at least insofar as I've played, those numbers are never significant. They can usually only withstand an attack or two before keeling over, and deal insignificant damage. The slimes have discovered, however, that they can take over the bodies of humans. They do so by leaping down people's throats and commandeering the unfortunate meatbags. There are many different kinds of slimes, each with a different ability. There are also 3 different elemental types, and every unit has one. Water beats Fire, Fire beats Grass, Grass beats Water. Deciding which units to enslave, how to properly move and position your units, and what slimes/abilities to use seem to be the cruces of playing Ambition. 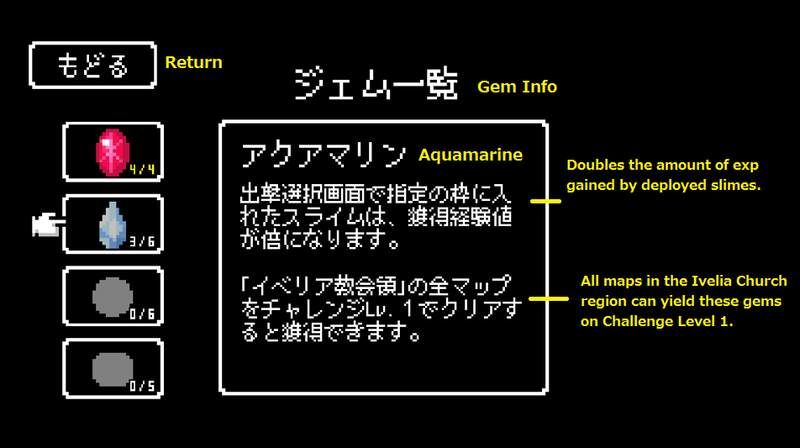 For those who would like to give it a whirl without knowing Japanese, on to the useful graphics! Here we have a basic game menu. Functional. Here are the basic stats for each slime. I think everything is pretty self explanatory except for "Fatigue." According to my research, this goes up as you use a slime. It will increase quicker as they reach higher levels. 0-99 fatigue have no effect, but once it reaches 100, the slime is too tired to attack. Fatigue seems to decrease over (real) time, by itself. You can check out all your units from the game menu and rearrange them for your viewing pleasure. Starting with a tutorial, you'll advance throughout several maps and take the fight to the humans. Each area brings up a screen like the one above. 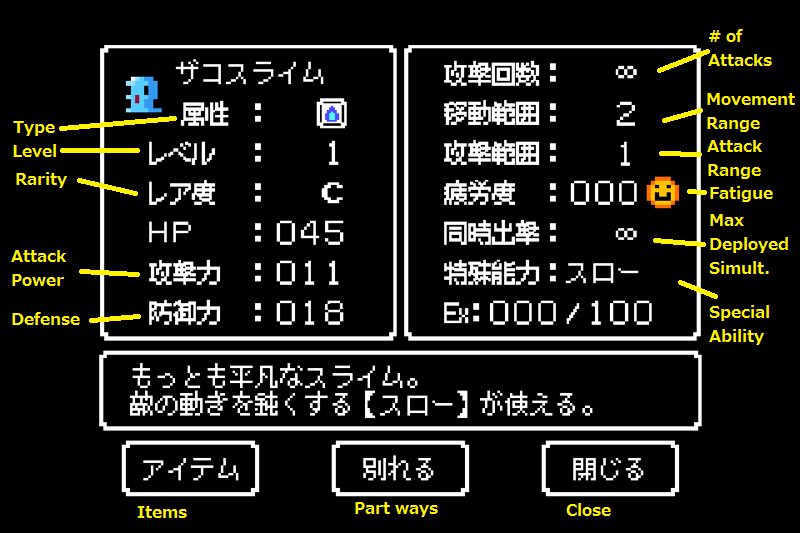 The important-to-note items here are the battle difficult at the top, expressed in stars; the enemy units; what slimes may join you if you win; the difficulty setting (normal or challenge); and the number of slimes you can deploy. One additional note about the difficulty setting - there are different levels of challenge that you can unlock as you beat the stage on easier settings. Harder battles offer better chances of awesome slime allies. When you start a map, here are the (mostly) relevant items you'll see. Excuse me for the crazy differences in image resolution. As I said, "quick and dirty." Units that you take over will gain red eyes and a sick glow. Just to give you an idea, yes, they literally do jump down people's throats. As pictured above. Another fact to note - there are two advantages to be considered when picking your battles and positioning. Higher ground means less damage taken and more dished out. Type advantage translates similarly. And yes, you can have both a height and type advantage at the same time. Tons of damage. - If a slime or its host dies in battle, it will "revive" when the fight is over. It won't gain as much exp, though. - Slime abilities can be pretty useful. The worm-looking guy can cast "speed" - a buff that increases the target's max movement by one tile. The starting blue slime can cast "slow" and the little red dude has a better chance of commandeering difficult-to-enslave humans. - Some humans are harder to take over than others. There are armor-clad knights which effectively can't be taken over unless you debuff them first with goo or break their armor. Bosses also appear to be especially difficult to capture. - If you commandeer a human with the same element type as the slime you're using, the human you gain will receive a stat boost. - I forgot to note that the little yellow flags on some tiles indicate regeneration points. If you stick a unit on one of these spaces, at the beginning of their next turn they'll regain some HP (and certain spells/abilities will be recharged too, it appears). These are pretty important! - Note that humans you possess who are in their underwear or naked can charm ("seduce") enemies of the opposite gender. 1. 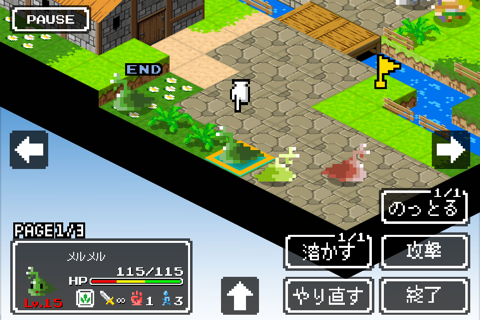 Later on in the game you will get a slime "ヘルメス" (Hermes?! ), whose special ability is to keep the human you took over for 1 battle. This means that if you take over an archer's body as ヘルメス (and stayed alive until you won the battle), you will have an archer replacing your ヘルメス within your units at your disposal. 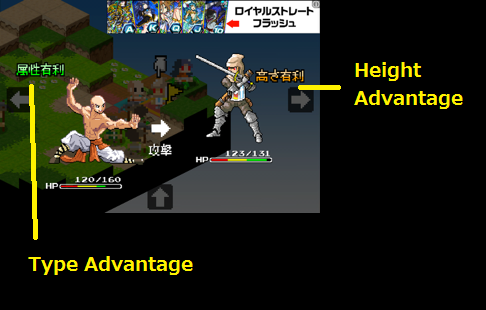 The archer's level does not show there because it will change depending on the difficulty of the next battle you bring your archer into (scales with enemys' level). 3. During battle, on the bottom left side of the screen you can tap and go through different pages of information. 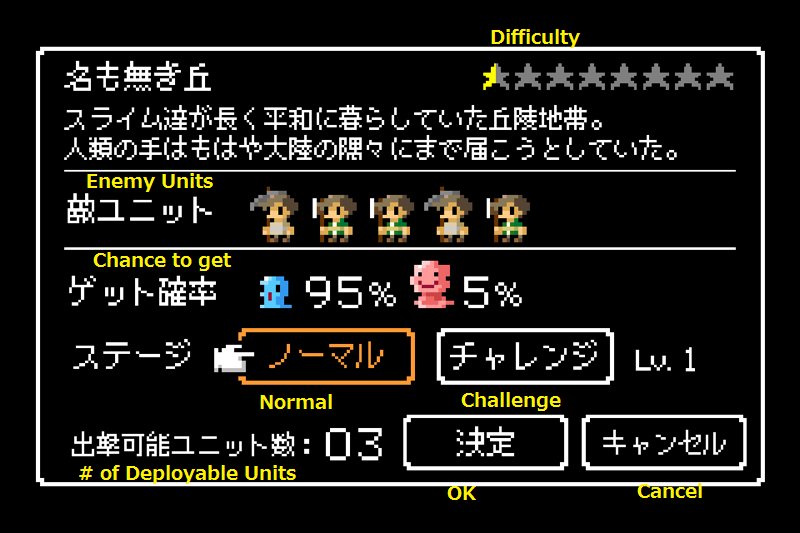 One of the page shows the stats of the unit, and the probability of you enslaving that unit. They give you very useful information in terms of deciding who to take over, and also who to avoid. (If it says のっとり：０００％ then don't even bother trying) (Paul: An addendum to this is that the little red slime you start with has a somewhat improved chance of capturing some units. This is not reflected in the info displayed here - you have to actually select the のっとり option to see the % chance for them). Here's a list of slimes and their specials. I'll be adding more as I collect them all. The translations, especially of their names, are approximate and may contain additional notes. Ability: Slow - reduces an enemy's movement by one tile. Ability: Take Over Up - has a somewhat better chance to commander moderately difficult to take over enemies. Ability: Speed - increases an ally's movement by one tile. Ability: Warp - can move anywhere on the map. Ability: Melt - dissolves an enemy's equipment. The enemy then becomes easy to enslave. (Note: Melt lasts for 3 turns, and then the enemies return to their normal state, enslaved or not. Humans you take over who are still in their underwear can charm enemies of the opposite gender. Ability: Attack Up - enslaved enemy receives increased attack power. (Note: These guys also get more attack power than other slimes as they level. I still wouldn't recommend using them to fight, but in a pinch they can do a little damage). Ability: Teleport - can teleport an ally to any tile on the map. Ability: Range Up - if used to enslave a ranged unit, extends attack range by one tile. Ability: Defense Up - enslaved enemy receives increased attack power. (Note: These slimes get a bit more defense than other slimes. Still can't take a ton of damage, but if you need to spread out some punishment you might be safer letting this guy take a hit rather than most of your other slimes). Ability: Magic Defense Up - enslaved enemy receives increased magic defense. Ability: Flying - this guy may not actually have wings, but he can fly. (Note: These slimes can travel over water and ignore the height of terrain). Ability: Magic Up - enslaved enemy receives increased magic attack. Ability: Pervy - if enslaved enemy is a female, they gain a large combat bonus. If said female is in her underwear or naked, she gets an even larger combat bonus. Ability: Super Melt - dissolves all of an enemy's equipment, rendering them naked. The enemy then becomes easier to enslave. (Note: Super Melt lasts for 3 turns, and then the enemies return to their normal state, enslaved or not. Humans you take over who are still in naked can charm enemies of the opposite gender). Ability: Carry Over - can carry over an enslaved unit to the next battle. The carried over unit can only be used once. Ability: Metal - has high defense. Additionally, enemies prioritize attacking these slimes. Ability: Resurrection - if enslaved enemy is slain, this slime revives. Works only once per battle. Ability: Resurrection - if enslaved enemy is slain, this slime revives. Works an unlimited number of times. Ability: Sticky - binds an enemy and grants a 100% chance to take over almost any foe. Ability: 0 Magic Consumption - enslaved enemy can use magic spells an unlimited number of times. Ability: Split - if damaged by an enemy, this slime will split into two. Works only once. Ability: Carry Over x3 - can carry over an enslaved unit to the next three battles. Ability: Take over UP - can take over enemies that are pretty difficult to enslave. Ability: Split x2 - if damaged by an enemy, this slime will split into two. The resulting slimes can split once more. Ability: Teleport - can teleport an ally to any tile on the map, three times. Ability: Sun - Has the special sun attribute, which trumps the others (I'm not sure if this carriers over to enslaved units, unlike with other slimes). 1. First tap "Shop" from the Main Menu. 2. Buy an item. The top one is energy recovery medicine - it resets a slime's fatigue to 0. They come in sets of 5 ($0.99), 15 ($1.99), and 30 ($2.99). 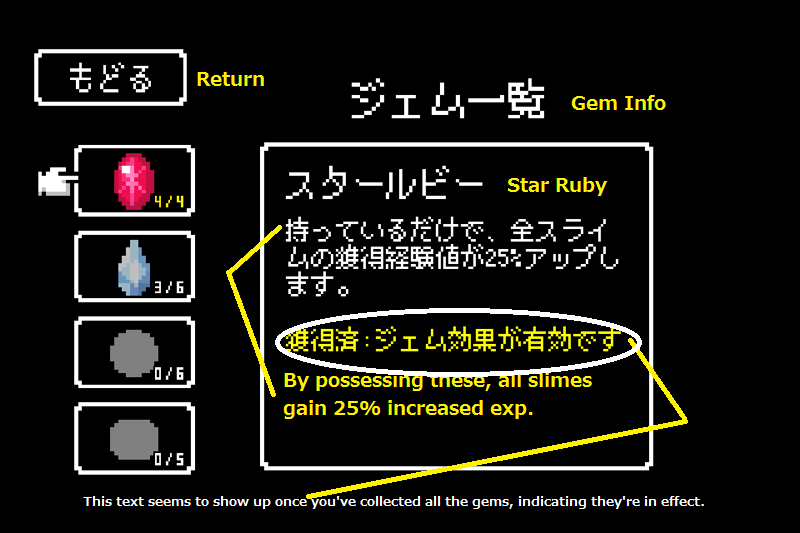 The bottom item lets you increase the amount of deployed slimes by 1. Use this item on the slime select screen before the battle begins. These come in sets of 3 ($0.99). As of 2.0, there are three items for sale - fatigue recovery medicine, deployment +1, and slime boxes. When you've selected an item, the App Store should prompt you to enter your password to confirm the purchase. 3. Go back to the Main Menu and select "Options." You'll then see the screen below. Select the first choice with the gear icon, which is "Settings." 4. Here you can disable the background music and sound effects, or turn off the ad banners. You can also switch to "Fast Mode," which makes turns go by quicker. Recommended. The last option lets you disable the ads, and the "OFF" selection is grayed out until you purchase an item. Once you've done that, your game should be ad-free! 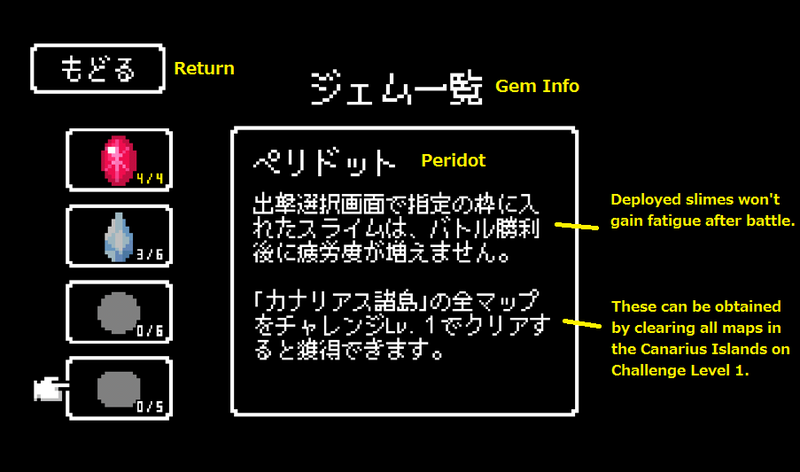 Version 2.0 added a new feature - gems. 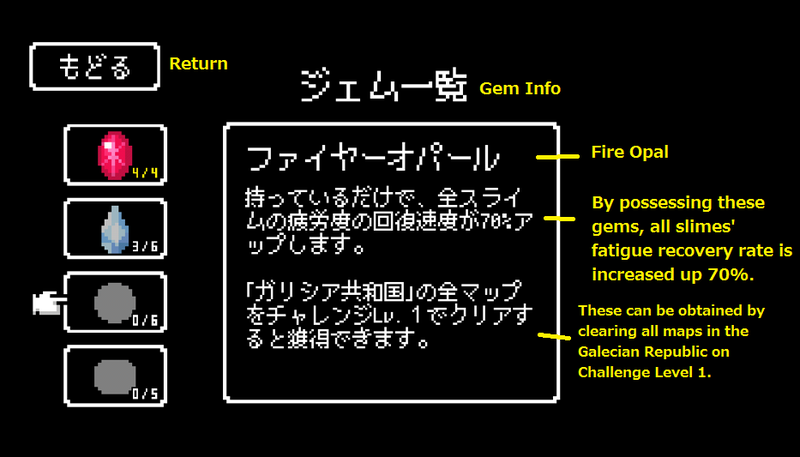 I haven't play around to test these out, but the translations for each gem are below. Sounds straightforward enough. If anyone has any requests for more info - additional slime abilities or elsewise, feel free to let me know and I can expand this guide. Also submit any tips, tricks, or corrections you'd like to share in the comments below. Update: Changed "Plant" to "Grass" (the kanji is 草, so "grass" is perhaps more literal). Update: I shared the link to this mini guide with Altair Works, the game developers for Ambition, and they added it to their App Store and Google Play app descriptions! So "welcome" to anyone stopping by from those pages. 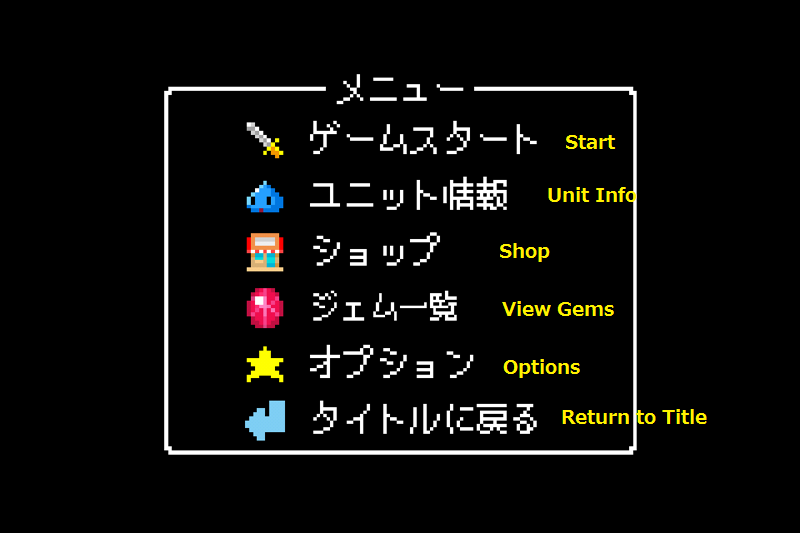 Update: Added Slimes and Abilities section. If you'd like to contribute, feel free to leave a comment and/or email me the slime screenshot at blueshoe[at]jadij.com. Update (10/29/2014): Tweeted a little bit with developer @Altairworks, and they told me that purchasing any item allows one to disable the ads. I'm adding a short section to address that. Update: (11/17/2014): Reader 1z2x3c sent me screencaps of the last of the slimes and I've added them, so they should all be listed here now. Update (1/12/2015): Updated the screenshots for the Main Menu, Shop, and Settings pages. Added "Gems" section. 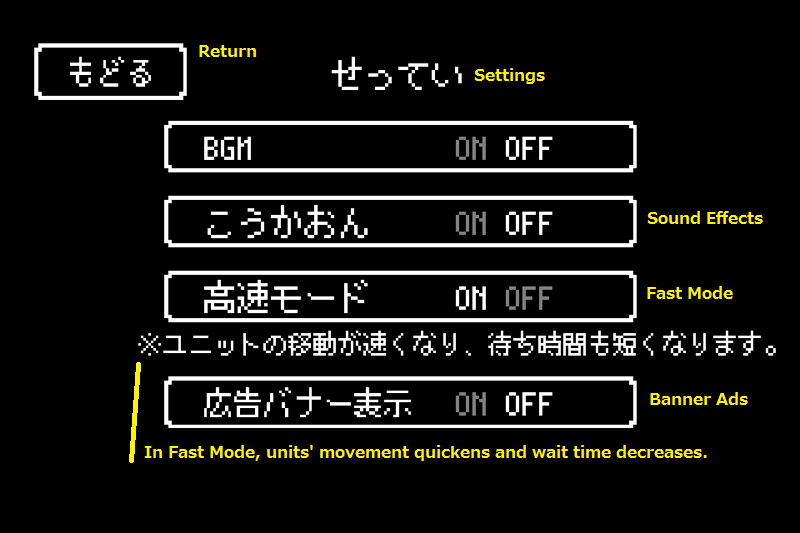 Added a note about "Fast Mode" in Settings. Update (1/13/2015): It looks like the developer is working on has released English support, so stay tuned for that! Update (2/20/2015): I know I said no more updates, but reader floppee sent me in another slime to add to the guide. So, Sun Slime added. Update (8/4/2015): A submission from commenter RainZ, adding two new slimes. * The translation for the name of this slime is not straightforward. See here for more details. ** Before you send me an email about the translation on this one being kind of made up, I named it so because I feel like this name makes more sense in the context of the localization choice I made for the related slime.